If your mom, wife, sister or grandmother spends most of her days being a mom and making sure everyone in her family is taken care of, then wouldn’t it be nice to give her something she can use to treat herself this Mother’s Day? 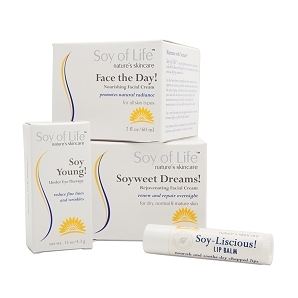 At Soy of Life, our skincare products are great for restoring and rejuvenating skin and can reduce age lines and wrinkles – wrinkles probably caused by stress from your younger days! Give your mom the gift of healthier, better-looking skin this Mother’s Day with a skin care package from Soy of Life. When that special mom in your life is running low on sleep, it can make her eyes look tired and heavy. Our Eye Solutions Package is just what she needs. This package comes with our Under Eye Therapy, which will regenerate and repair the delicate skin around the eye with the help of all-natural soy ingredients, enhanced with GLA-rich oils. It also includes our All-in-One Perfecting Crème, which can help eliminate dark circles and puffiness under the eye area, while replenishing moisture and restoring vitality to skin. For the mom who deserves it all and rarely takes time for herself, our Deluxe Facial Care Package is a treat. This package includes our Under Eye Therapy, Nourishing Facial Cream, Rejuvenating Facial Cream and Soy-licious Lip Balm. Spoil that special mom in your life with facial products that will help keep her skin looking young and glowing. Our Ultimate Facial Care Package can help revitalize even the hardest-working mom’s skin, with either our 2-in-1 Cleanser & Toner, or Nourishing Cleansing Milk, plus Under Eye Therapy, Perfecting Facial Serum, All-in-One Perfecting Crème, Nourishing Facial Cream, and Rejuvenating Facial Cream. This package includes something for day, something for night, and something to combat those fine lines and wrinkles. The Premium Facial Care Package is another option, and includes a little bit of everything. Choose between our Renewing 2-in-1 Cleanser and Toner or our Nourishing Cleansing Milk with honey, and also receive Under Eye Therapy, All-in-One Perfecting Crème, Nourishing Facial Cream, Rejuvenating Facial Cream, and Soy-Licious Lip Balm. The premium package has everything your mom will need to truly treat her skin like a queen and she’s sure to see the benefits of all-natural soy on her complexion. All of Soy of Life’s products are made with natural soy and other ingredients. Our creams, balms and other treatments have incredible skin-healing properties and you’re sure to see the difference when using our products. Order your Mother’s Day gift or gift for yourself online now or give us a call at 877-SOY-FOR-U today.